Sven Začek - In your face! A picture I always wanted to take, I imagined something like this when I started out as a nature photographer. Of course back then I had a vision of an eagle coming down and capturing a snowshoe hare. I still have that vision from talks with local hunters, who had found a dead Golden Eagle with a snowshoe hare in it’s one talon and it’s other talon was stuck in tree, which it must have used to break for landing. That must have been quite a sight if anyone was there to witness the live event. 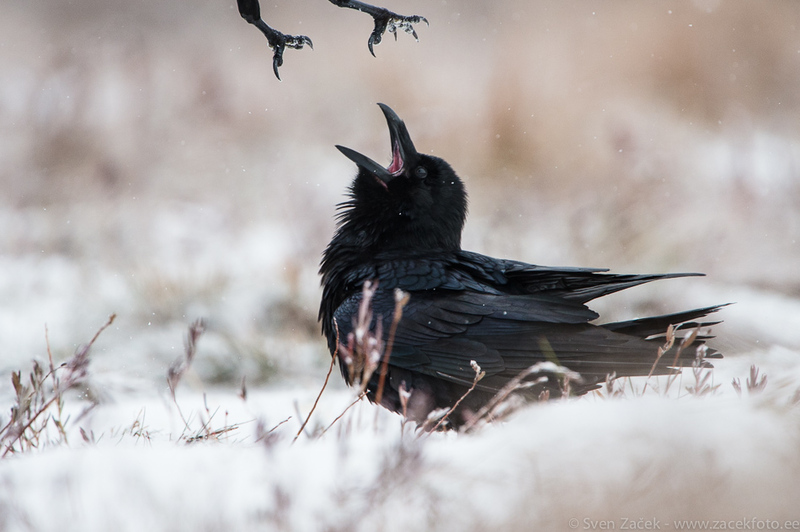 Anyway, after 10 years I have to do with a picture of ravens teasing each other. I accept this happily 🙂 and keep crossing my fingers for an eagle and hare. Photo info - Winter: : Nikon D4 + Nikkor 400mm F2,8 VR + Nikkor TC-17EII. F4,8, 1/1000, ISO 2000. Very, very cool one, Sven! Keep on dreaming, it will come!